Florida Secretary of State Ken Detzner. Photo credit: Adapted by WhoWhatWhy from State of Florida / Wikimedia and typographyimages / Pixabay (CC0 1.0). 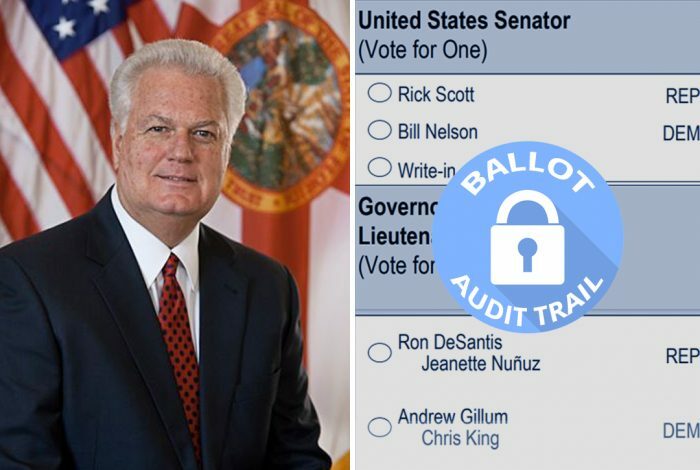 Concerned Florida voters scored a victory in Florida by pressuring Secretary of State Ken Detzner’s (R) office to notify all counties about federal and state legal requirements to preserve ballot images. Those are the digital copies needed to verify the outcomes of elections. This is especially important in the Sunshine State, where voters get to decide two cliffhanger races with major implications for the future of the country. Both the Senate race and the gubernatorial contest are too close to call and, if Florida’s election history is any guide, they could be headed for recounts. audits, are conducted in full compliance with the law. Concerned that Florida election officials would violate federal law and destroy the ballot images before the legally mandated 22-month preservation period, Attorney Benedict P. Kuehne — on behalf of concerned Florida voters — sent a letter to Detzner earlier this month asking him to instruct state election officials not to destroy the ballot images. For those utilizing voting systems that are programmed to capture images of ballots as they are scanned, those images may be subject to retention requirements under the public records law. Supervisors of Elections should consult with their county attorney or legal counsel regarding any questions about public records, and the retention and/or disclosure of such records. Attorney Chris Sautter worked alongside Kuehne to represent voters in the state who want all election departments to follow the law and retain their ballot images, ensuring a proper chain of custody necessary to verify the elections. Sautter is happy the state sent the notice to all election supervisors. “We are very pleased, and we consider this another victory,” Sautter said. However, Sautter said the notice buries their main concern — that voters want election supervisors to know that they are required by law to save the ballot images. In a related yet separate issue, AUDIT-USA believes that Sunshine State officials already violated federal law when they overwrote data from the state’s August 28 primary to prepare for the general election. This is done by programming the voting machines for the November 6 election before saving the August results. The letter they sent is intended to head off similar action by Florida when voting ends for next week’s midterms. Susan Pynchon, executive director of Florida Fair Elections Coalition, is an election integrity investigator who audited many county election departments in Florida this year. She has been working on election integrity issues in Florida since 2004 and was featured in the documentary Hacking Democracy. 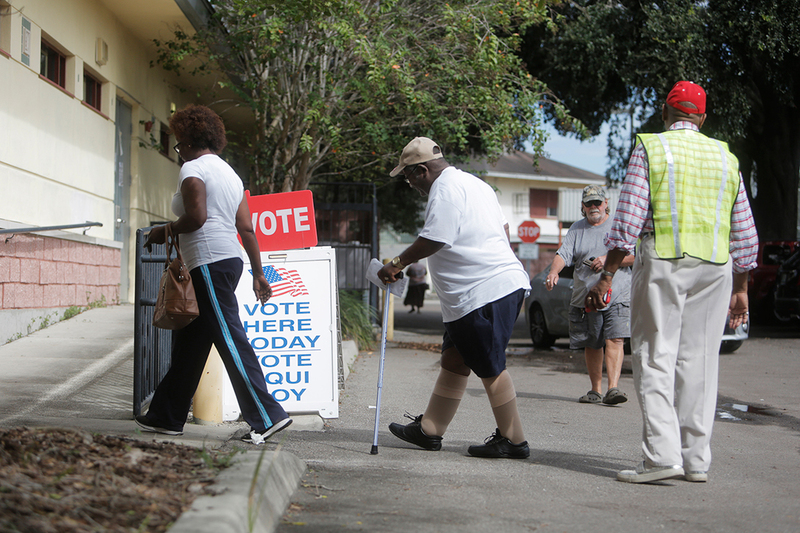 John Brakey, director of AUDIT-USA, told WhoWhatWhy the goal is to make election results in Florida — and the whole country — transparent, trackable, and publicly verified. This would not only benefit voters but also keep elections safe from potential adversaries overseas. AUDIT-USA and its allies conducted an investigation into whether ballot images from the Florida primary had been illegally destroyed. They found that, of 67 counties in the state, 11 are preserving ballot images, 22 counties are not, and it is unknown what exactly is happening in 31 counties. Three counties use optical scanner voting machines that don’t create ballot images. The 22 counties that do not preserve ballot images account for more than 64 percent of the total vote in Florida, with the potential to decide statewide races one way or the other. Florida is a crucial state every election year, Brakey said. Now that Florida has sent the notice to the election departments, it helps further the goal of showing elections are legitimate. AUDIT-USA already believes the state has everything in place to conduct a well-run election. Ultimately, what Brakey and his nonpartisan group want is for Florida to follow the law.